Pneumoconiosis - body, causes, What Causes Pneumoconiosis? Pneumoconiosis (noo-mo-ko-nee-O-sis) is a disease of the lungs caused by long-term breathing of dust, especially certain mineral dusts. Forms of pneumoconiosis include black lung disease (coal worker's pneumoconiosis), silicosis, and asbestosis. The disease typically results from working in a mine for many years, but factory work and other occupations can expose people to the ill effects of breathing dusts. The term "pneumoconiosis" comes from the Greek pneumon, meaning lung, and konis, meaning dust. Only microscopic-size dust particles, about 1/5,000 of an inch across or smaller, are able to reach the tiniest air sacs (the alveoli) in the lungs. There they cannot be removed, and accumulate to cause a scarring and thickening of the lungs called fibrosis (fy-BRO-sis). Eventually, the lungs begin to lose their ability to supply oxygen to the body. The prevalence of black lung disease did not begin to decrease until it became clear that the cause was excessively high levels of coal dust in mines. Largely due to the efforts of coal miners' unions, occupational safety conditions improved. 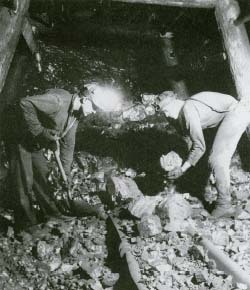 In 1969, the Mine Health and Safety Act set standards in the United States for maximum allowable levels of coal dust in mines. The Act also provided compensation for miners who developed black lung disease. Death rates from pneumoconiosis have been declining since the Act was passed. Breathing coal dust was an occupational hazard for coal miners, especially those who did not wear protective masks. Black lung disease is caused by breathing coal dust, usually in mines. Silicosis results from inhaling silica dust from sand and rock, primarily in mines, quarries, and in occupations such as sandblasting. Asbestosis comes from breathing tiny asbestos fibers in mining, building construction, and other industries. Less commonly, other kinds of dust are continuously inhaled in work-related situations and cause pneumoconiosis. What Happens When People Have Pneumoconiosis? Because pneumoconiosis usually takes 20 or 30 years to develop, workers often do not notice symptoms until they are over 50. The main symptoms are coughing and difficulty in breathing, which gradually increases. Complications include emphysema (em-fe-SEE-ma) and increased risk of tuberculosis. Asbestosis patients are more likely to develop lung cancer, especially if they smoke cigarettes. Damaged lungs make the heart work harder, and heart problems can accompany severe cases of pneumoconiosis. Diagnosis is made by physical examination and through a medical history that tells the doctor which dusts patients have been exposed to. The doctor may also take chest x-rays and pulmonary (lung) function tests. There is no cure for pneumoconiosis, because the dust cannot be removed from the lungs. Even if it could, the damage done to the lungs from years of inflammatory reaction to the dust could not be undone. Except in a mild form called simple pneumoconiosis, the disease is progressively disabling. The only treatment is to avoid smoking and further exposure to dust, and to treat complications. Pneumoconiosis can be prevented by enforcing maximum allowable dust levels in mines and at other work sites, and by using protective masks. Regular medical examinations, including chest x-rays for people at risk, can detect pneumoconiosis during its earlier stages, before it becomes disabling. Derickson, Alan. Black Lung: Anatomy of a Public Health Disaster. Ithaca, NY: Cornell University Press, 1998. This book provides historical information on black lung disease.